For the next week, I will be showing sites around the northern Italian city of Milan, which is famous for many things, but not so much for its ancient Roman and Paleo-Christian past. I often feel that cities, such as St. Louis, are known for the “same old thing” oftentimes, just like Milan, and by looking at the fascinating way the Italian fashion and industrial center lives among different layers of history going back thousands of years while living a modern, trendsetting future, can be inspiring for us back home. 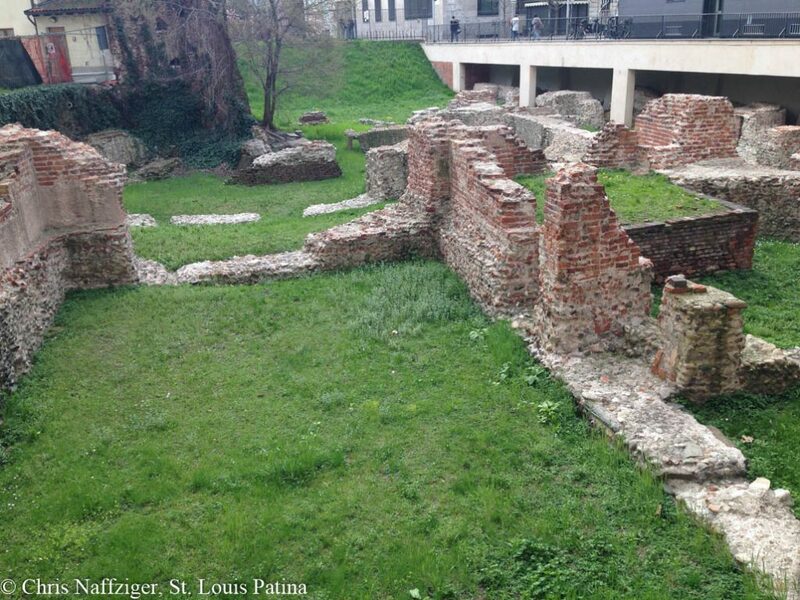 Take for example, the almost completely destroyed ruins of the Imperial Palace, built by the Roman Emperor Maximianus, tucked away on a side street far from the tourists near the cathedral and shopping malls. It does not look like much, but it is an incredibly historic place. As the barbarians threatened the empire to the north, the capital moved from Rome to Mediolanum, what had been a Gallic city, and what would become modern-day Milan.